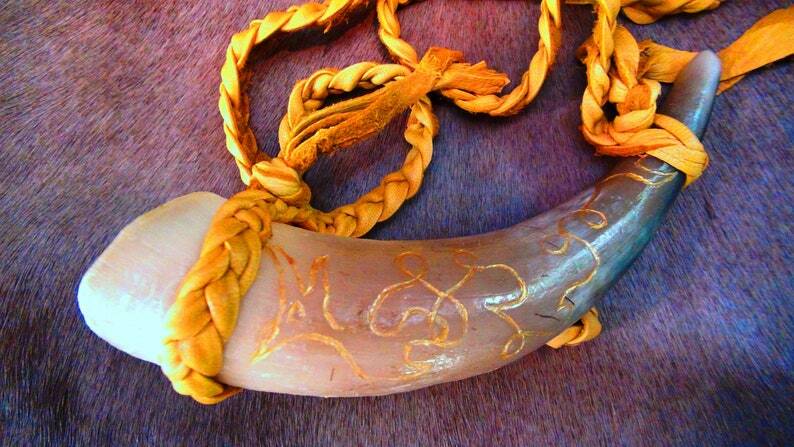 This beautiful steer drinking horn measures about 10 inches in length and 2.75x2 inches wide at the mouth. The horn in the photo is the exact horn you will receive when you purchase. This drinking horn holds 1 cup of fluid. The strap is made of brain tanned sheep leather and measures 55 inches. The sheep leather strap is made for both hoops to slide off the bottom but not the top for easy cleaning. The leather is thick so the strap is very sturdy! I left this horn unpolished on the outside for a rough look. I also engraved a dragon along the one side and painted it with gold acrylic. I was aiming for the rough look to allow the gold inlay to stand out more. Over the gold I coated it with a clear acrylic varnish to seal the paint. The Drinking Horn has long been associated with the Scandinavian’s and the Viking era, but they were also very popular with the Anglo-Saxons and the Celtic people, especially around Wales and Ireland. In many of those cultures the Drinking Horn was more heavily used by “nobility” rather than “common folk” that used bowls and wooden cups. Materials such as leather, antler, metal, ceramic, bone, stone and wood were also used to make drinking vessels, not just horn. The Drinking Horns used by many of the Scandinavian people’s during the Viking era were from a now extinct bovine called Aurochs, which were huge animals from which modern day cattle stemmed. They brandished horns that spread two and half feet each and could stand six feet at the shoulders! No matter if you have Scandinavian blood, Celtic blood or any other blood, the Drinking Horn today is just as special and powerful as it was long ago. If you enjoy quaffing beer, sipping wine, drinking mead, guzzling grogs or downing bragots, doing so from a genuine Drinking Horn can make the occasion that much more enjoyable! I get each steer horn in the rough. After sanding them down I scrub and wash them thoroughly. Then I sand the mouth. Once sanded and cleaned I heat the horn in the oven and polish the exterior with a buff rag and bees wax. When the horn shines I scrub the interior again and wash thoroughly. Once again I heat them in the oven and apply bees wax to the interior to seal the horn. Using quality leather of deer, cattle, elk, goat or sheep, I cut and braid heavy duty straps. After all that the horn is ready for a nice brew! Please note that heat can reshape the horn. Do not use this horn for hot liquids or hard alcohols. Mead, wine, beer/ale, water and even cool or luke warm tea is fine. Simply wash with soap and water to clean. You can use a bottle brush for the interior if necessary.